We released 50 new lessons and a bunch of new items for the Canvas. Have fun with your kids! We’ve just started an Instagram account! Follow Peru and his friends Niwi, L and JJ as they embark upon fun learning adventures together. We are happy to announce the release of v2.3.0. – Digital Copel is now also available in Chinese (Simplified and Traditional), Spanish and German languages. – Added the new Canvas Creation feature that allows you take take pictures of the towns. New homepage with a fresh design, some fun courses and a new web PC desktop/web version of Digital Copel. Play Now! We’re proud to announce the release of Digital Copel v2.2.1 which brings many new exciting updates. Experience adaptive learning with Digital Copel! 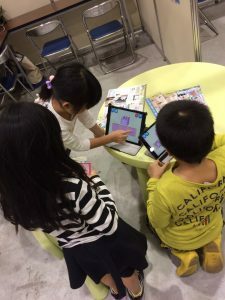 In a collaboration effort with Takeo City Library in Saga Prefecture, we are pleased to announce we have begun offering a free rental service of tablets specifically loaded with Digital Copel. Library users may use the tablets for 30 minutes in the children’s reading area of the library. We released Digital Copel TV for Apple TV. 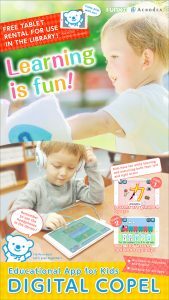 It contains a mixture of Japanese and English kids songs along with Hiragana and Katakana song lessons. 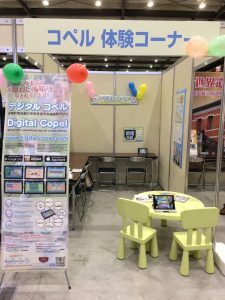 We hosted a “Experience Digital Copel!” booth at the Kurashiga Smart 2016 event in the city of Kita-kyushu. Lots of children had fun trying out Digital Copel. We have released Digital Copel v2.0.1 with some fixes and new easy to understand tutorials. – Copel Canvas – get decorations from completing lessons and design your own Copel Canvas. – Town maps! Lessons are now spread all over Copel Town. Explore the maps to find them all. – Completely renewed menus and interfaces. 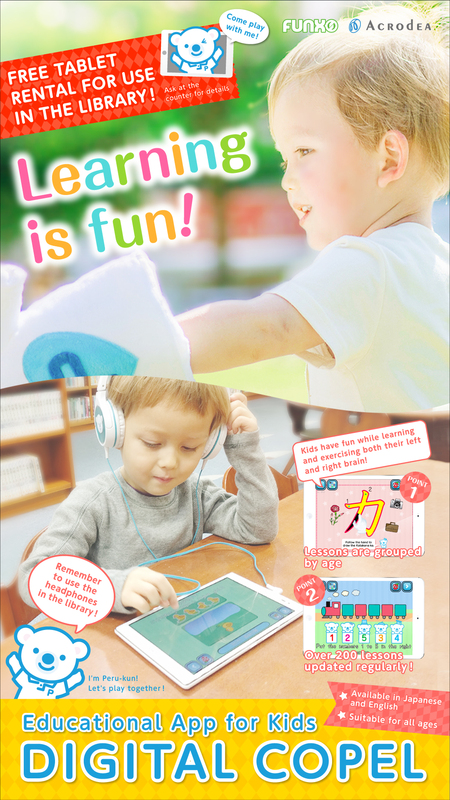 – Read the Copel manga talking about the benefits of Copel education. – Various performance improvements and bug fixes. 7 new exciting lessons just added! 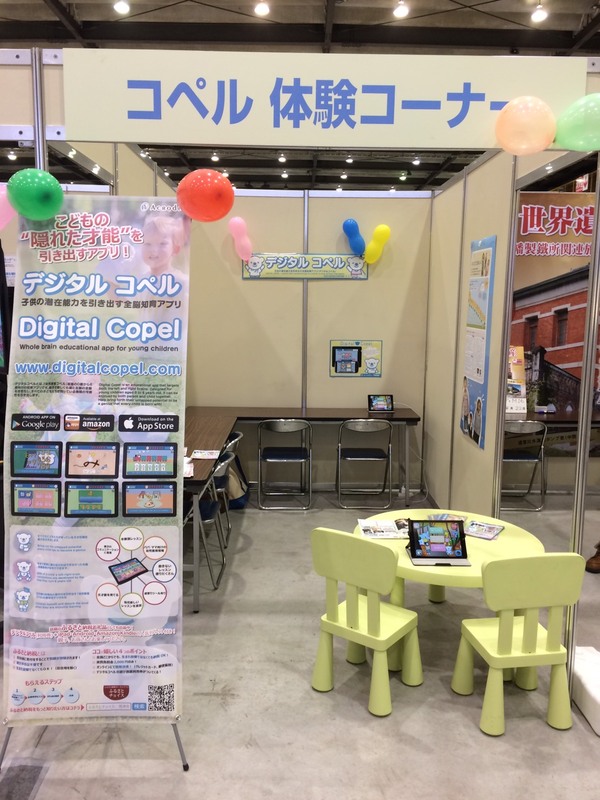 For 20 years, the Japanese company Copel has been providing education for young children throughout Japan in their own special Copel Classrooms. As of Feb 2017, there are 77 throughout Japan. One of the core concepts of the Copel teaching methodology is that children learn best when having fun. 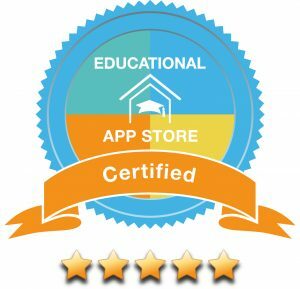 Each lesson that Copel provides is unique and originally developed by their team of education professionals. By strengthening the connection between the two hemispheres in the brain, a child’s untapped potential to become a genius can be brought forward, nurtured and encouraged. After a conducting a survey with 600 students and their parents, 99% of them responded positively saying that they were highly satisfied with Copel and were seeing real results in their children. After taking an IQ test of students who had attended Copel’s classrooms for one year, their average IQ result was over 130 compared to the norm for their peers which is 100. © 2019 FUNX. All Rights Reserved.